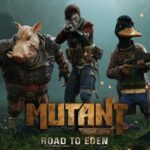 In February there was the exciting announcement by FUNCOM e The Bearded Ladies for their new effort MUTANT YEAR ZERO: Road to Eden. The game features mechanics at XCOM with the addition of STEALTH and exploration of the gaming world. In the game, we will lead a group of bizarre heroes (A duck, a pig, and Selma) in a post-apocalyptic world in search of Eden. In this video, you find 31 minutes of gameplay from the developers themselves, which has impressed us a lot. Mutant Year Zero: Road to Eden will be developed for Pc, Ps4 and Xbox One sooner or later in 2018.